If you are a heavy user of Google's Google+ social networking product you are probably keeping the site running in a tab all the time to never miss new messages. But even if you do, you need to switch back to the tab regularly to see if there are any new notifications on Google+. Notifier extensions make sure that users stay informed even if they close the Google+ browser window. Up until now, Chrome users could make use of third party notifiers which, while working perfectly, were not official which may have kept some users from installing and using those extensions. 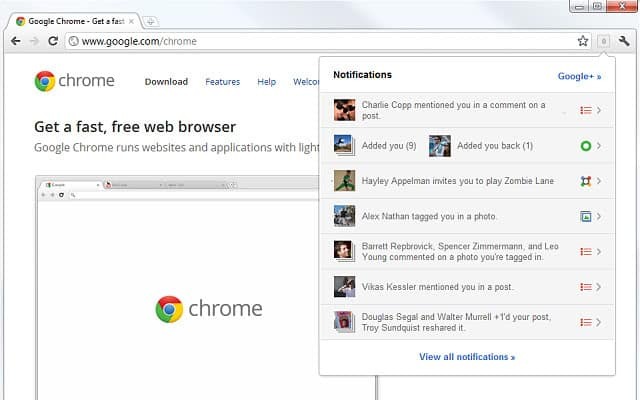 Google yesterday released the official Google+ notification extension for the Google Chrome browser. Google+ Notifications works in principle just like any other notification extension. The new message count is displayed in an icon in the Chrome address bar after installation. The count goes up for new unread messages and down once those messages get read by the user. The button of the notification extension turns red whenever updates are waiting for the user. A click on the button displays all recent messages and updates on Google+. This feature is a copy of the Google Toolbar button that offers the exact same functionality. Notifications include updates on who added you on Google+ and who added a comment or +1 to one of your posts or a post you commented on. A click on an update leads directly to the Google+ website where it can be read in full. The notifications window also links directly to the Google+ user profile and offers to load the "all notifications" page on the website as well.